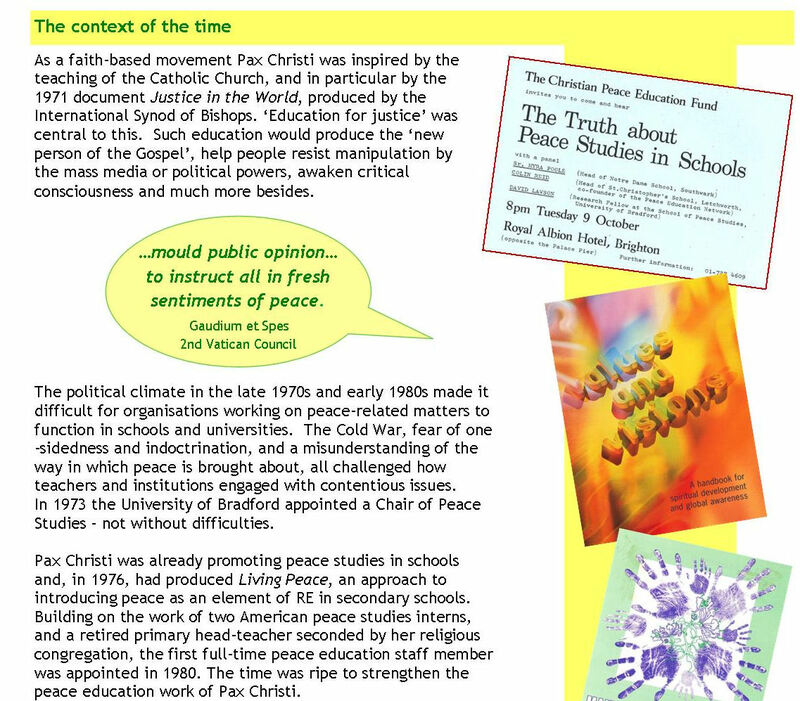 We were delighted to see schools picking up on the invitation to support Peace Sunday and use the resources provided by Pax Christi’s peace education worker. A number of the schools that Aisling visited posted their activities on Twitter and we were able to share them. Here is one from Holy Family school . Great to get feed-back from schools! Inter-generational conversations on faith, peace and justice. CPEF trustee John Williams took part! Pax Christi, along with other organisations, has been involved in a project promoting inter- generational conversations. The conversations have taken place around the country and brought together people from different generations to discuss their faith and its role in their engagement in justice and peace. As well as feedback being given to the Bishops of England and Wales at the current Synod on youth in Rome, Pat Jones has written an insightful article, ‘Bursting the Bubble’, for The Tablet on the conversations and what we can learn from them. You can visit the website at www.peoplefaithjustice.org.uk for more information on the conversations, including some interesting videos and resources to hold your own inter-generational conversation. the acceptance of all people of the world as members of the human family. Thirty-five years on I can think of no better way of saying what we still embrace. This is a 21st century statement pertinent to all involved in education at every level, pre-school, primary, secondary and adult. John Williams is a trustee of the Christian Peace Education Fund. Archbishop Malcolm McMahon, National President of Pax Christi, hosted an evening celebrating 35 years of the Christian Peace Education Fund. Archbishop Malcolm thanked all those who had contributed to the Fund through donations and legacies and acknowledged all the work of the Trustees and supporters who have maintained the Fund for 35 years. The Fund was set up by Pax Christi to support its own peace education work and to ‘promote peace by means of meetings, lectures, seminars, the production of books and publications and lots more besides.’ Valerie Flessati, Pax Christi General Secretary when the fund was created, reflected on the difficulties experienced by schools and teachers at that time, when peace education was seen as suspect and one-sided. Pax Christi was determined to support teachers and educators in their work to help young people reflect critically on the world in which they lived. Matt Jeziorski, Pax Christi’s current Peace Education Officer spoke of Pax Christi’s role in creating space within schools and work with teachers to allow time for discussion and discernment on difficult issues of war, peace and conflict and the Christian vocation to peacemaking. The future challenge was set by James Trewby, the education worker for the Columban Missionaries. Imagination and collaboration were two of the key elements of this challenge, using approaches that engage young people beyond their own reality to create understanding and empathy and building networks and opportunities to mirror how many of the world’s problems today, war, poverty, climate issues, are interconnected Over the years grants have been given to more than 120 projects, including Peace Trails, school exchanges, conferences, dvd’s and study guides. The Movement for the Abolition of War had received grants towards their annual Peace History Conference. The Interfaith Wolverhampton hosted an exhibition and study day on the theme of forgiveness with the grant they received from CPEF. Most recently, St Paul’s School, Milton Keynes hosted a day for six schools on the theme of Faith in Action.